"I love the way they directly connect organizational elements with technology tools." We select and implement tailor-made MarTech Stacks. Tell me your challenges and I can suggest direction. We organize your content engine to continuously feed the marketing technology beast. Want to know how? A well designed MarTech Stack is aligned around the customer, built to achieve business goals and loved by the team. A MarTech Stack is the set of marketing technology tools that marketers use to execute marketing activities across channels. It's an eco-system of best-of-breed tools that are iteratively added to fulfil a specific need. They often contain multiple sub-stacks, such as content management, collaboration, marketing automation, social media, sales enablement, CRM and performance dashboards. This is an example of a productivity stack we've built. 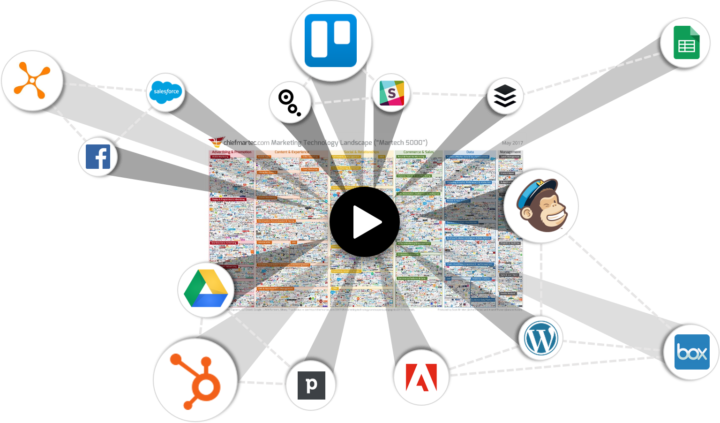 We can build your tailor-made Marketing Technology Stack. "In 2020, content will become marketing's biggest bottleneck"
MarTech Stacks are vessels for content. With the adoption of marketing technology marketers face a new challenge; how to continuously create relevant content to facilitate the customer journey and feed the marketing automation beast? A content engine is the answer. It is the set of processes, teams, tools and stories that need to be organized to generate valuable content at scale. Does your content answer the 9-questions that convert the B2B buyer? We can organize your content engine. It’s become a yearly tradition for Scott Brinker to release the marketing technology landscape at the MarTech conference in the spring. In 2018 Boardview contributed to the "most loved-and-hated slides" in marketing. Enterprise software is out. MarTech stacks are in. The shift from enterprise software to MarTech stacks is fundamental. In marketing technology, adoption has always been the biggest hurdle to take, even if all the features are there. A clear and brief explanation on WHY you want certain strategic goals to be achieved, combined with empowered teams is often all you need to be able to execute a strategy. We are here to answer any questions you may have about Boardview. Or just pop in to say Hello. Leave your details to start the conversation.